WordPress News, Deals, Reviews and much more! WordPress has grown tremendously over the years since it’s beginning. It started as a simple blogging platform where anyone could easily set up and manage their own blogs. It’s now grown into a full fledged content management system that can be used to create large websites, e-commerce systems and more. While most people see this as a good thing (myself included) there are those that wish there were a platform built for simple blogging again without all the extras WordPress comes with, and that’s where Ghost comes in. Ghost is a project built by ex WordPress staff that has now been fully funded thanks to it’s kick-starter campaign. It aims to make blogging simple again without any fuss, but at the same time allowing beautiful design and publishing. Ghost is all about putting the focus back onto the writing. There won’t be any e-commerce plugins, directory sites or many of the other large and wonderful things you can create with WordPress, Ghost will be all about the blogging full stop. The easiest way to see what ghost is all about is to head over to their website ghost.org and take a look at all the features. 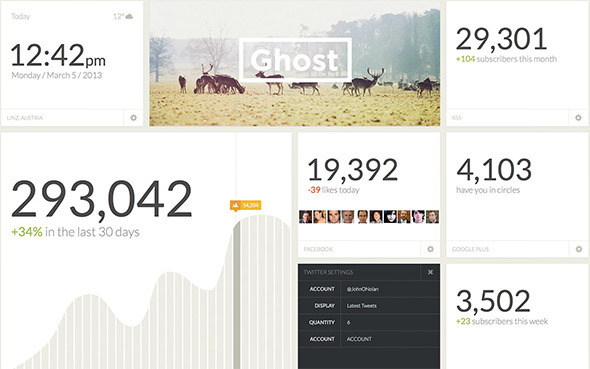 If you love writing and blogging then chances are you are going to like the look of Ghost. Themes will also be available for Ghost in a similar way they are for WordPress, they’ve already partnered with Themeforest so expect some premium themes to show up soon. Themes will be similar to WordPress themes and created in a similar way, but will focus more on making the content the first and most important part. As of the 14th of October Ghost has just released to the public . You go ahead and download it here. At the moment it’s only available to be installed on your own server, but a hosted version is expected in the coming works. Will you be trying Ghost? Have you already tried it? Let me know your thoughts below! Stay up to date with all things WordPress. We'll send you an email now and again with exciting WordPress news and deals. I'm the lead author at WPKnight as well as an experienced WordPress designer. I also design for PixelFox Design from time to time. Feel free to contact me about anything.